Though LOTTE is global general confectionery company now, we started from 1948 in Japan as the chewing gum manufacturer. We have been researching and developing chewing gum for almost 70 years and thus, have highly specialized knowledge and skill in chewing gum in every way. Our chewing gum products are designed with hundreds of trials and deep consideration in order to satisfy the consumer preferences for flavor, texture, long-lasting, funciton, pleasure, etc. and offer the best quality. One of our main brands is LOTTE XYLITOL. We focused on the characteristic property of xylitol, which is a kind of sugar alcohol and the main ingredient of LOTTE XYLITOL, and started the development of chewing gum containing xylitol long before xylitol was generally recognized in Japan. Xylitol had the advantege of not being the cause of tooth decay but we were faced with a problem that it had an harsh taste and undesirable effect on the key benefit, a refreshing feeling, of chewing gum. To overcome the issue, we conducted countless trials with mixing other sugar alcohols and sweeteners, and improving flavor & others also. Finally we succeeded in developing the epoch-making chewing gum which provides both ‘deliciousness’ and ‘keeping teeth strong and healthy’ with healthy ingredients. All our gum produced in Lotte Vietnam are developed by taking Vietnamese consumers needs into consideration sincerely based on Lotte's technology. In 1964, LOTTE started manufacturing & selling of chocolate with the aim of developing from a chewing gum company to general confectionery company. LOTTE aimed to make authentic Switzerland chocolate which has a feature of smooth melting in the mouth. LOTTE invited a chocolate specialist from Switzerland to have consult manufacturing method and authentic chocolate quality. Now, LOTTE grew to have No.1 sales chocolate brand that is loved by a lot of people. Koala's March was launched in 1984 is a crispy biscuits product filled with milk chocolate. In addition, many kinds of Koala characters are printed on the biscuits surface. It is not easy to print koala designs on the biscuits accurately. By testing about the print color material and original printing equipment many times, LOTTE realized to print on the biscuits surface clearly. Moreover, the high quality chocolate utilized the original blend technology cultivated through years of chocolate research is injected in the biscuits. A combination of these technologies creates not only cute looking but delicious taste with a feeling of satisfaction. Toppo was launched in 1994 is a stick chocolate biscuits made of crispy pretzel and full of mild milk chocolate. Stick type chocolate biscuits was already in the market, but consumer had dissatisfaction that hands and clothes are stainded with melted chocolate. In order to solve this dissatisfaction, Toppo's development was started from the idea of reversal of switching the inside (pretzel) and outside (chocolate). Baking a homogeneous cylindrical pretzel and filling the chocolate in the thin tube were never easy. LOTTE studied the dough formula and the mixing time and condition thoroughly, and succeeded in manufacturing the hollow crisp pretzel eventually. In addition, LOTTE designed & developed a dedicated manufacturing facility to fill until the edge of the pretzel with chocolate, and realized the quality to feel the chocolate taste until finishing to eat. In 1972, LOTTE started manufacturing & selling of ice cream following chewing gum and chocolate. Lotte established a biggest ice cream factory in the East at that time with introducing state-of-the-art machines. While dairy makers occupy the market, Lotte who entered as a latecomer, has raised its presence by launching a number of unique products. Today, Lotte have grown to become a No. 1 company in the ice cream category in Japan and possess many brands loved by many people. YUKIMI was launched in 1981, Japan's unique mochi ice cream. 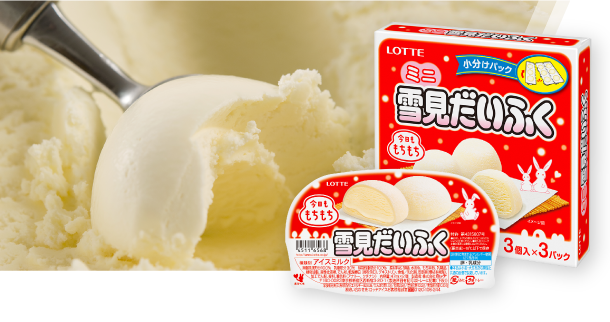 Lotte created innovation by special manufacturing technology of wrapping cold ice cream with warm mochi. In addition, Lotte have developed mochi that does not become hard even under frozen conditions, due to the unique formulation of Lotte, which was produced from years of research, such as rice varieties and sugars used. For now, Mochi ice cream has spread all over the world, but as a pioneer of it, YUKIMI continues to evolve and it is now one of the most beloved ice cream brands in Japan. Coolish is an ice cream that came in pouch container, which was launched in 2003. Coolish created a new category in the ice cream market where there were only fixed forms such as bars, cups and cones. It is a revolutionary ice cream that can be eaten anywhere and can be eaten while doing something because it can be eaten in one hand. In addition, Lotte's unique formulation and technology like micro size of ice make it easier to sucking from the pack after picking from the freezer, and make the original texture. In 2004, Coolish won the first-prize of the award (Global Sialdoll) as Asian food at the Paris international fair because it's evaluated highly to be able to eat without making hands dirty. By being loved by anyone from children to adults, Coolish has grown to be the No.1sales brand in our ice cream business.